I just got the GT500 splitter for my 08 CS. I will post one how much work it is to install with some pictures when I get it on. AWESOME!!! Also, when you get it installed, and take pics, can you take a picture showing a ruler next to the chin spoiler? I ask, as I want to see how much ground clearance is left once its added to the front of the CS bumper. Thanks for the help and look forward to your review/install tips, and pics. Will do. Probably be next weekend before I do the install. I am going to pick up some new plugs to hold it on. I have already taken my front end down a couple of times and noticed that the existing plugs aren't holding as tight anymore. I assume you mean measurement from the bottom of the splitter to the ground for the ground clearance. Yes, thank you. I just wanted to see how much ground clearance is lost with adding the GT500 chin splitter. Thanks for the help and can't wait to see how it looks. Okay bad news. Went out today to install the splitter and ended up not doing it. I disasembled the existing pieces and placed the chin spoiler on the car. A couple of things, almost none of the mouting points matched up. It is almost as if they intentionally moved many of the mounting points off just a bit so they could not be used. I know that I could drill out new mounting holes on the spoiler and if that was the only problem I might have done it. The bumper on the GT500 is flat all the way across and the bumper on the CS is indented in the middle. While looking down like the picture at the beginning of this thread, it does not look too bad, but from a more straight on view, it does not look very good, at least I didn't think so. Not a crack on anybody else's car, just didn't work for me. So while with a bit of fabrication and work it could probably be made to work, it just was not the look I was wanting or hoping for, so I decided not to do the mod, I want a more polished look than I felt this gave. As far as ground clearance, it looks like you would loose about 1/2 to 5/8 of an inch with the splitter installed. Sorry everybody, but it just was not working for me. The Saleen one is definitely similar to our GT/CS's; at least the bottom portion. There's definitely a gap in the center section but they have separators under there and it looks pretty good. Last edited by 2007CalSpec; 1/4/09 at 06:33 AM. Any chance you can post some pics of the issues? I really like the look of the part, and I'm willing to consider engineering a solution. He's talking about the gap in the middle section between our fascia and the GT500 spoiler. Here's a pic of a Saleen fascia that has a bottom edge similar to the CS's. 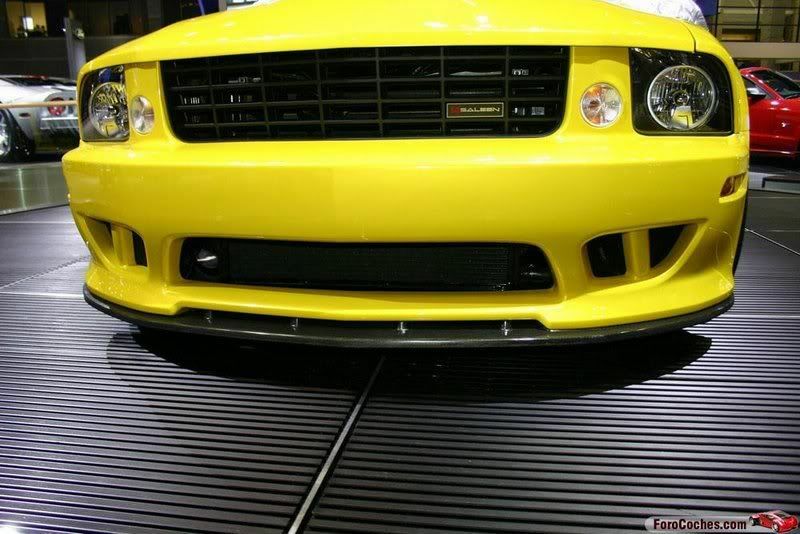 The Saleen also has a front splitter and you could see the gap in the middle between the splitter and the bottom of the fascia. The Saleen one has vertical separators in the gap though. I think it looks good nonetheless. I'll probably still get the GT500 splitter and install it on my CS. I don't mind that gap. Last edited by 2007CalSpec; 1/4/09 at 03:02 PM. I don't mind the gap either, but MustHaveStang was also talking about the fact that none of the holes lined up. This is the issue I want to look at. I prefer the GT500 splitter because of it's overall profile. The fact that it is narrower in the middle ties in nicely with the center of the bumper, plus the way it extends around to the front of the wheel opening, which the Saleen version does not. I'm going to do a little more research on the mounting, but after seeing the GT install threads on other sites, I think this might be worth the effort, it's a good look. No doubt! I appreciate the input very much Richard. What's up buddy! How is the block searching going? Let me know how this splitter works out. I'm probably gonna get my CS front bumper painted this spring. Sorry for not getting back sooner. Yes I was talking about the gap where the lower bumper is inset on the CS, and I think the Saleen splitter looks better there. It was must more work than I was looking to do, but if somebody is pretty good with fabrication then they could probably make this look good. Sorry I did not take any pictures, but I never actually installed the splitter, just held it in place, took measurements and checked out the alignment and mounting points. I look forward to hear what other peoples experience is if they decide to do the install.